Usury (/ˈjuːʒəri/) is the practice of making unethical or immoral monetary loans that unfairly enrich the lender. Originally, usury meant interest of any kind. A loan may be considered usurious because of excessive or abusive interest rates or other factors. Historically, in some Christian societies, and in many Islamic societies even today, charging any interest at all would be considered usury. Someone who practices usury can be called a usurer, but a more common term in contemporary English is loan shark. The term may be used in a moral sense—condemning, taking advantage of others' misfortunes—or in a legal sense where interest rates may be regulated by law. Historically, some cultures (e.g., Christianity in much of Medieval Europe, and Islam in many parts of the world today) have regarded charging any interest for loans as sinful. Banking during the Roman Empire was different from modern banking. During the Principate, most banking activities were conducted by private individuals who operated as large banking firms do today. Anybody that had any available liquid assets and wished to lend it out could easily do so. The annual rates of interest on loans varied in the range of 4–12 percent, but when the interest rate was higher, it typically was not 15–16 percent but either 24 percent or 48 percent. The apparent absence of intermediate rates suggests that the Romans may have had difficulty calculating the interest on anything other than mathematically convenient rates. They quoted them on a monthly basis, and the most common rates were multiples of twelve. Monthly rates tended to range from simple fractions to 3–4 percent, perhaps because lenders used Roman numerals. Moneylending during this period was largely a matter of private loans advanced to persons persistently in debt or temporarily so until harvest time. Mostly, it was undertaken by exceedingly rich men prepared to take on a high risk if the profit looked good; interest rates were fixed privately and were almost entirely unrestricted by law. Investment was always regarded as a matter of seeking personal profit, often on a large scale. Banking was of the small, back-street variety, run by the urban lower-middle class of petty shopkeepers. By the 3rd century, acute currency problems in the Empire drove such banking into decline. The rich who were in a position to take advantage of the situation became the moneylenders when the increasing tax demands in the last declining days of the Empire crippled and eventually destroyed the peasant class by reducing tenant-farmers to serfs. 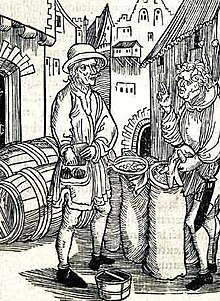 It was evident that usury meant exploitation of the poor. The First Council of Nicaea, in 325, forbade clergy from engaging in usury (canon 17). At the time, usury was interest of any kind, and the canon forbade the clergy to lend money at interest rates even as low as 1 percent per year. Later ecumenical councils applied this regulation to the laity. Most early religious systems in the ancient Near East, and the secular codes arising from them, did not forbid usury. These societies regarded inanimate matter as alive, like plants, animals and people, and capable of reproducing itself. Hence if you lent 'food money', or monetary tokens of any kind, it was legitimate to charge interest. Food money in the shape of olives, dates, seeds or animals was lent out as early as c. 5000 BC, if not earlier. ...Among the Mesopotamians, Hittites, Phoenicians and Egyptians, interest was legal and often fixed by the state. But the Hebrew took a different view of the matter. The Hebrew Bible regulates interest taking. Interest can be charged to strangers but not between Hebrews. Israelites were forbidden to charge interest on loans made to other Israelites, but allowed to charge interest on transactions with non-Israelites, as the latter were often amongst the Israelites for the purpose of business anyway; but in general, it was seen as advantageous to avoid getting into debt at all, to avoid being bound to someone else. Debt was to be avoided and not used to finance consumption, but only taken on when in need; however, the laws against usury were among many laws which the prophets condemn the people for breaking. "And what do you think of usury? "—"What do you think of murder?" As the Jews were ostracized from most professions by local rulers, the Western churches and the guilds , they were pushed into marginal occupations considered socially inferior, such as tax and rent collecting and moneylending. Natural tensions between creditors and debtors were added to social, political, religious, and economic strains. ...financial oppression of Jews tended to occur in areas where they were most disliked, and if Jews reacted by concentrating on moneylending to non-Jews, the unpopularity—and so, of course, the pressure—would increase. Thus the Jews became an element in a vicious circle. The Christians, on the basis of the Biblical rulings, condemned interest-taking absolutely, and from 1179 those who practiced it were excommunicated. Catholic autocrats frequently imposed the harshest financial burdens on the Jews. The Jews reacted by engaging in the one business where Christian laws actually discriminated in their favor, and became identified with the hated trade of moneylending. In England, the departing Crusaders were joined by crowds of debtors in the massacres of Jews at London and York in 1189–1190. In 1275, Edward I of England passed the Statute of the Jewry which made usury illegal and linked it to blasphemy, in order to seize the assets of the violators. Scores of English Jews were arrested, 300 were hanged and their property went to the Crown. In 1290, all Jews were to be expelled from England, allowed to take only what they could carry; the rest of their property became the Crown's. 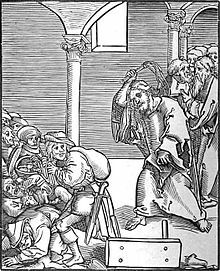 Usury was cited as the official reason for the Edict of Expulsion; however, not all Jews were expelled: it was easy to avoid expulsion by converting to Christianity. Many other crowned heads of Europe expelled the Jews, although again converts to Christianity were no longer considered Jewish. Many of these forced converts still secretly practiced their faith. The growth of the Lombard bankers and pawnbrokers, who moved from city to city, was along the pilgrim routes. Die Wucherfrage is the title of a Lutheran Church–Missouri Synod work against usury from 1869. Usury is condemned in 19th-century Missouri Synod doctrinal statements. Charles Eisenstein has argued that pivotal change in the English-speaking world came with lawful rights to charge interest on lent money, particularly the 1545 Act, "An Act Against Usurie" (37 Hen. VIII, c. 9) of King Henry VIII of England. St. Thomas Aquinas, the leading scholastic theologian of the Roman Catholic Church, argued charging of interest is wrong because it amounts to "double charging", charging for both the thing and the use of the thing. Aquinas said this would be morally wrong in the same way as if one sold a bottle of wine, charged for the bottle of wine, and then charged for the person using the wine to actually drink it. Similarly, one cannot charge for a piece of cake and for the eating of the piece of cake. Yet this, said Aquinas, is what usury does. Money is a medium of exchange, and is used up when it is spent. To charge for the money and for its use (by spending) is therefore to charge for the money twice. It is also to sell time since the usurer charges, in effect, for the time that the money is in the hands of the borrower. Time, however, is not a commodity for which anyone can charge. In condemning usury Aquinas was much influenced by the recently rediscovered philosophical writings of Aristotle and his desire to assimilate Greek philosophy with Christian theology. Aquinas argued that in the case of usury, as in other aspects of Christian revelation, Christian doctrine is reinforced by Aristotelian natural law rationalism. Aristotle's argument is that interest is unnatural, since money, as a sterile element, cannot naturally reproduce itself. Thus, usury conflicts with natural law just as it offends Christian revelation: see Thought of Thomas Aquinas. Concerns about usury included the 19th century Rothschild loans to the Holy See and 16th century concerns over abuse of the zinskauf clause. This was particularly problematic because the charging of interest (all interest, not just excessive interest) was a violation of doctrine at the time, such as that reflected in the 1745 encyclical Vix pervenit. As a result, work-arounds were employed. For example, in the 15th century, the Medici Bank lent money to the Vatican, which was lax about repayment. Rather than charging interest, "the Medici overcharged the pope on the silks and brocades, the jewels and other commodities they supplied." However, the 1917 Code of Canon Law switched position and allowed church monies to be used to accrue interest. In The Divine Comedy Dante places the usurers in the inner ring of the seventh circle of hell. Interest on loans, and the contrasting views on the morality of that practice held by Jews and Christians, is central to the plot of Shakespeare's play "The Merchant of Venice". Antonio is the merchant of the title, a Christian, who is forced by circumstance to borrow money from Shylock, a Jew. Shylock customarily charges interest on loans, seeing it as good business, while Antonio does not, viewing it as morally wrong. When Antonio defaults on his loan, Shylock famously demands the agreed upon penalty-a measured quantity of muscle from Antonio's chest. This is the source of the phrase "a pound of flesh" often used to describe the dear price of a loan or business transaction. Shakespeare's play is a vivid portrait of the competing views of loans and use of interest, as well as the cultural strife between Jews and Christians that overlaps it. By the 18th century, usury was more often treated as a metaphor than a crime in itself, so Jeremy Bentham's Defense of Usury was not as shocking as it would have appeared two centuries earlier. In Honoré de Balzac's 1830 novel Gobseck, the title character, who is a usurer, is described as both "petty and great—a miser and a philosopher..." The character Daniel Quilp in The Old Curiosity Shop by Charles Dickens is a usurer. In the early 20th century Ezra Pound's anti-usury poetry was not primarily based on the moral injustice of interest payments but on the fact that excess capital was no longer devoted to artistic patronage, as it could now be used for capitalist business investment. "When money is lent on a contract to receive not only the principal sum again, but also an increase by way of compensation for the use, the increase is called interest by those who think it lawful, and usury by those who do not." (William Blackstone's Commentaries on the Laws of England). Usury laws are state laws that specify the maximum legal interest rate at which loans can be made. In the United States, the primary legal power to regulate usury rests primarily with the states. Each U.S. state has its own statute that dictates how much interest can be charged before it is considered usurious or unlawful. If a lender charges above the lawful interest rate, a court will not allow the lender to sue to recover the unlawfully high interest, and some states will apply all payments made on the debt to the principal balance. In some states, such as New York, usurious loans are voided ab initio. The making of usurious loans is often called loan sharking. That term is sometimes also applied to the practice of making consumer loans without a license in jurisdictions that requires lenders to be licensed. On a federal level, Congress has never attempted to federally regulate interest rates on purely private transactions, but on the basis of past U.S. Supreme Court decisions, arguably the U.S. Congress might have the power to do so under the interstate commerce clause of Article I of the Constitution. Congress imposed a federal criminal penalty for unlawful interest rates through the Racketeer Influenced and Corrupt Organizations Act (RICO Statute), and its definition of "unlawful debt", which makes it a potential federal felony to lend money at an interest rate more than twice the local state usury rate and then try to collect that debt. It is a federal offense to use violence or threats to collect usurious interest (or any other sort). Separate federal rules apply to most banks. The U.S. Supreme Court held unanimously in the 1978 case, Marquette Nat. Bank of Minneapolis v. First of Omaha Service Corp., that the National Banking Act of 1863 allowed nationally chartered banks to charge the legal rate of interest in their state regardless of the borrower's state of residence. In 1980, Congress passed the Depository Institutions Deregulation and Monetary Control Act. Among the Act's provisions, it exempted federally chartered savings banks, installment plan sellers and chartered loan companies from state usury limits. Combined with the Marquette decision that applied to National Banks, this effectively overrode all state and local usury laws. The 1968 Truth in Lending Act does not regulate rates, except for some mortgages, but requires uniform or standardized disclosure of costs and charges. In the 1996 Smiley v. Citibank case, the Supreme Court further limited states' power to regulate credit card fees and extended the reach of the Marquette decision. The court held that the word "interest" used in the 1863 banking law included fees and, therefore, states could not regulate fees. Some members of Congress have tried to create a federal usury statute that would limit the maximum allowable interest rate, but the measures have not progressed. In July 2010, the Dodd–Frank Wall Street Reform and Consumer Protection Act, was signed into law by President Obama. The act provides for a Consumer Financial Protection Bureau to regulate some credit practices but has no interest rate limit. Canada's Criminal Code limits the interest rate to 60% per year. The law is broadly written and Canada's courts have often intervened to remove ambiguity. Japan has various laws restricting interest rates. Under civil law, the maximum interest rate is between 15% and 20% per year depending upon the principal amount (larger amounts having a lower maximum rate). Interest in excess of 20% is subject to criminal penalties (the criminal law maximum was 29.2% until it was lowered by legislation in 2010). Default interest on late payments may be charged at up to 1.46 times the ordinary maximum (i.e., 21.9% to 29.2%), while pawn shops may charge interest of up to 9% per month (i.e., 108% per year, however, if the loan extends more than the normal short-term pawn shop loan, the 9% per month rate compounded can make the annual rate in excess of 180%, before then most of these transaction would result in any goods pawned being forfeited). In a partnership or joint venture where money is lent, the creditor only provides the capital yet is guaranteed a fixed amount of profit. The debtor, however, puts in time and effort, but is made to bear the risk of loss. Muslim scholars argue that such practice is unjust. As an alternative to usury, Islam strongly encourages charity and direct investment in which the creditor shares whatever profit or loss the business may incur (in modern terms, this amounts to an equity stake in the business). Growth of the Internet internationally has enabled both business micro-lending through sites such as Kickstarter as well as through global micro-lending charities where lenders make small sums of money available on zero-interest terms. Persons lending money to on-line micro-lending charity Kiva for example do not get paid any interest, although the end users to whom the loans are made may be charged interest by Kiva's partners in the country where the loan is used. Zinskauf was used as an avoidance mechanism in the Middle Ages. ^ "Usury". Oxford English Dictionary. Oxford University Press. 2012. Retrieved 26 October 2012. ^ The word is derived from Medieval Latin usuria, "interest", or from Latin usura, "interest"
^ Jain, L. C. (1929). Indigenous Banking In India. London: Macmillan and Co.
^ Zgur, Andrej: The economy of the Roman Empire in the first two centuries A.D., An examination of market capitalism in the Roman economy Archived 2012-06-11 at the Wayback Machine, Aarhus School of Business, December 2007, pp. 252–261. ^ Temin, Peter: Financial Intermediation in the Early Roman Empire Archived 2011-07-17 at the Wayback Machine, The Journal of Economic History, Cambridge University Press, 2004, vol. 64, issue 03, p. 15. ^ a b Moehlman, Conrad H. 1934. "The Christianization of Interest." Church History. Issue 3, p. 6. ^ "Deuteronomy 23 / Hebrew Bible in English / Mechon-Mamre". www.mechon-mamre.org. ^ Examples of debt: 1 Samuel 22:2, 2 Kings 4:1, Isaiah 50:1. Prophetic condemnation of usury: Ezekiel 22:12, Nehemiah 5:7 and 12:13. Cautions regarding debt: Prov 22:7, passim. ^ "Usury - The Root of All Evil". The Spirit of Now. Peter Russell. ^ "Thomas Aquinas: On Usury, c. 1269-71". Fordham University. ^ "The Prophet Muhammad's Last Sermon". Fordham University. ^ Bodhi, Bhikku. "Right Speech, Right Action, Right Livelihood (Samma Vaca, Samma Kammanta, Samma Ajiva)". Buddhist Publication Society. Retrieved 29 June 2012. ^ "Petition of the Jews of Paris, Alsase, and Lorraine to the National Assembly, January 28, 1790." Ed. Hunt, Lynn. The French Revolution and Human Rights: A Brief Documentary History. Bedford Books of St. Martin's Press, 1996, p. 96. ^ Cooper, Zaki (31 July 2015). "Christian approach to usury forced Jews into money lending". Financial Times. Retrieved 21 March 2018. ^ "A Hebrew - English Bible According to the Masoretic Text and the JPS 1917 Edition". Retrieved 4 January 2013. ^ T.L. Bouscaren and A.C. Ellis. 1957. Canon Law: A Text and Commentary. p. 825. ^ Honoré de Balzac (1830). Gobseck . Translated by Ellen Marriage – via Wikisource. ^ a b Larson, Aaron (17 August 2016). "Legal Limits on Interest Rates for Loans and Credit". ExpertLaw.com. Retrieved 6 April 2018. ^ a b "Maximum Interest Rate Matrix" (PDF). docutech. Docutech Corporation. May 2013. Retrieved 6 April 2018. ^ "18 USC Chapter 42: Extortionate Credit Transactions". Legal Information Institute. Cornell Law School. Retrieved 6 April 2018. ^ The Effect of Consumer Interest Rate Deregulation on Credit Card Volumes, Charge-Offs, and the Personal Bankruptcy Rate Archived 2008-09-24 at the Wayback Machine, Federal Deposit Insurance Corporation "Bank Trends" Newsletter, March, 1998. ^ "15 U.S. Code Part A". Legal Information Institute. Cornell Law School. Retrieved 6 April 2018. ^ "FINANCE CODE CHAPTER 349. PENALTIES AND LIABILITIES". www.statutes.legis.state.tx.us. ^ Waldron, Mary Anne (2011). "Section 347 of the Criminal Code "A Deeply Problematic Law"". Uniform Law Conference of Canada. Retrieved 2012-01-01. ^ "上限金利の引き下げ". Japan Financial Services Association. Retrieved 16 January 2014. Wikimedia Commons has media related to Usury.